You are currently browsing the tag archive for the ‘sugar-free’ tag. Since it was “The Savoy Truffle” that originally inspired me to begin this blog, it only makes sense that I begin with my vegan interpretations of all the delights George Harrison crooned over (and warned us about). What’s nice about this particular selection is, depending on the cookie you use, it could be completely sugar-free, since I call for the use of agave nectar as the main sweetening agent. An interesting and fun fact about the song Savoy Truffle is that Harrison penned it as a way to rib his friend Eric Clapton about Clapton’s sweet tooth. Apparently all of the treats in the song were actually selections from a box of chocolates Clapton had been gnoshing on, except for the “cool cherry cream” and the “coconut fudge”. But don’t worry, I’ll be re-creating those in due time. 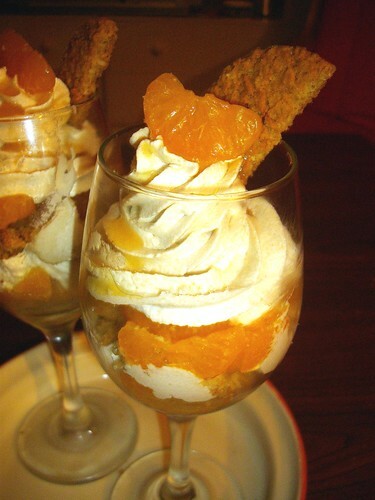 A luscious whipped orange-scented cashew cream layered with tangerine sections and cookie crumbs. Inspired by the first verse of the song Savoy Truffle, by the Beatles. Drain the can of tangerine sections, reserving the juice in a measuring cup. Add white grape juice. If necessary, add water to make 4 cups of liquid, total. Pour this into a saucepan and add the cashews. Bring to a boil, then reduce the heat to medium. Simmer for until the cashews are soft, about 10 minutes. Cover the pot and let cool enough to handle. Drain liquid off cashews and reserve it in a measuring cup. Add cashews to your blender or food processor. Add melted coconut oil and begin whizzing. While the blender is still working, slowly add the warm cooking liquid through the top until a thick, smooth cream is formed. Add 1 teaspoon of the orange extract, 2 tablespoons of the agave nectar and a pinch or two of sea salt and blend again. Transfer to a mixing bowl, cover, and let sit in the fridge until completely chilled. While this chills, make the tangerine-agave sauce. Put the juice back into the saucepan, add the remaining 2 tablespoons of agave nectar and bring to a full boil. Reduce heat to a simmer and let cook, uncovered until the liquid has evaporated off, leaving you with about a cup of juice. Remove a few tablespoons into a mug, let cool slightly, then whisk in 2 tsp of cornstarch. Add this mixture into the boiling reduction, along with the remaining teaspoon of orange extract, and whisk until slightly thickened. Remove from heat and set aside to cool. When the cashew cream is completely cold, whip with your stand mixer’s whisk attachment, or use your electric beaters. It should increase in volume by nearly 50% or more. The more the better, really. When you feel it’s fluffed up enough, bust out two of your favourite fancy glasses. I used wine glasses but this would look equally impressive in martini glasses or margarita glasses. Crush your cookies of choice and place a layer in the bottom of each glass. Top with a layer of tangerine sections, then a generous layer of cashew cream. Repeat, using a piping bag on the last layer of cashew cream for that fancy flourish you see in my photo. Garnish each glass with a half a cookie, a section of tangerine, and a scant drizzling of the tangerine sauce. Chill until ready to serve. *You are welcome to use fresh fruit in this dish, though I’d recommend getting fussy and removing as much of the pith (white stuff and strings) from the tangerine sections as possible. They tend to be bitter, and detract from the texture. Your call, totally.